Each one of you dream to score big in your exams. Obviously, many people think of scoring good in an easy way. Let's say, with the help of some important questions given by the lecturer or by taking the wrong way(i.e cheating in the exams). Before you cheat, you must understand the loss you might face by cheating in the exams. Copying answers from chits is very easy. But, you may feel embarrassed when you see your friends become successful without cheating. 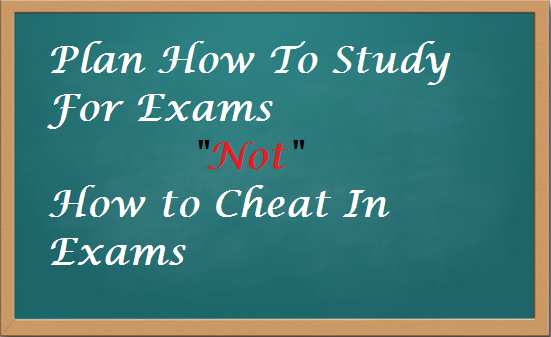 In this article, I am listing out few reasons why you really should avoid cheating in exams. Yes! You may not see or feel their hatred towards you, but you will definitely lose their company. Especially, the one who are successful. They word hard genuinely to score good marks. And when they see people cheating and scoring better than them, they might surely feel jealous and that causes hatred towards each other. This case might also happen between the best friends too. Breaking your parents trust is the worst thing to do, isn't it? They spend a lot of money on their kids education believing that one day, their kid will become a successful man/women. But, cheating in exams to make parents happy is same as cheating with your parents. Though they don't know how you wrote, but you will feel ashamed of yourself when you think in what way you actually wrote. Remember, making your parents smile by working hard is much better than making them smile by cheating in exams. You may cheat and score cent percent marks in your exam, but you will never feel proud of yourself. Why? Because, when you cheat and score 70% marks and meanwhile, when you see your friends/classmates scoring equal or better than you, you will feel embarrassed that they scored equal to you without cheating. Plus, they might start teasing you for not scoring more than them even after cheating. You will surely score cent percent marks by cheating in your exams, but what about the knowledge on that subject? How embarrassed you may feel when the lecturer asks you a question in the class? This might be another reason for your friends/classmates to tease you for having zero knowledge/skills. How about the placements that will occur in the school/college? Can you clear the interview rounds if you have zero knowledge? No company recruits a student who does not have any knowledge on a particular subject. This can be noted as one of the main reason that will help you perform well on your job work. Imagine you are copying answers from the chit and suddenly, the invigilator caught you! How embarrassed would you feel when the invigilator or the examiner catches you with chits? What your friends or classmates would think about you? What if the examiner books you for a year or 2? What excuse would you have when your parents asks you? Before you do anything, take some time and think about their disadvantages. Follow Danish Khan at Wikidot.